gus, originally uploaded by jahansell. Just for the day, we went to Manhattan to visit my sister. The Central Park Zoo was the perfect short outing, and I couldn't resist this photo of old Gus, the notoriously strange Polar Bear, who spent at least 20 minutes while we were there hanging out in the window of his enclosure, surveying his adoring fans. How funny to see this. 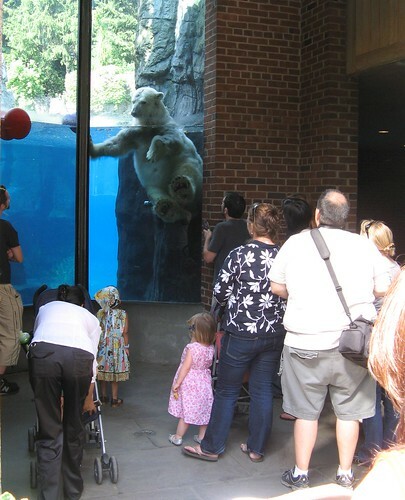 We lived in Manhattan until my eldest daughter was three and she love the Central Park Zoo, and in particular the polar bears. They are always so much fun.